The following piece is a guest blog entry. The views expressed in it are not necessarily those of Runway Games and are entirely those of the author. Retro-styled games seem to be a really hot gaming trend at the moment. There has been numerous indie successes catering to the nostalgia craze. The best games have been masters at combining the best things from the old days with modern mechanics. CrossCode looks to be one of those games. CrossCode is a single-player Action-RPG about a player stuck in an MMO of the distant future. Now before you think traditional fantasy with sword and sorcery, this game is all about one thing: throwing VRPs – or simply “balls” as everyone seems to call it. Not only are these balls your trusty tool to master several dungeons full of puzzles, they are also your weapons. Together with close-range attacks and special skills, they help you to fend off hordes of enemies. If you have been following along our Facebook (which you should), then you will have read about some vague updates coming to Solar Roller. It’s about time we reveal just what those changes are, don’t ya think? Skins, skins, and skins! Play the updated version, and you’ll instantly notice a huge difference. Not only have we applied new skins to the platforms, but some of the planets got a new and improved look as well. We’ve even applied some particle systems to this updated version, giving some plants a unique atmosphere. We’ve even added an entirely new planet, ready to be conquered at a moment’s notice. With this new planet, it poses new challenges. We are introducing three new platforms, each ready to rock your world. The red will make things a little hotter, the green might make you want to stay a little while longer, and the blue? Well, I hope you’re ready to try your patience because it might just have a mind of its own. 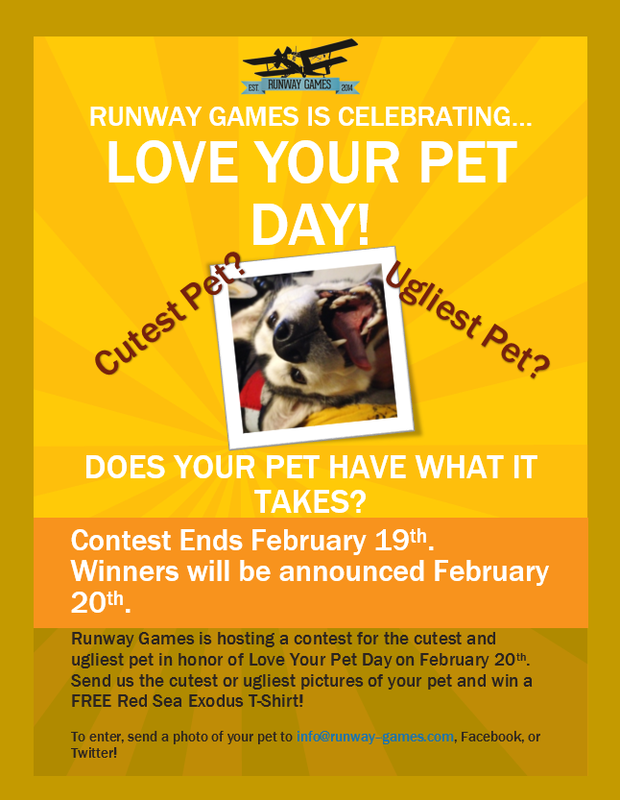 February 20th is Love Your Pet Day, and at Runway Games, we love our pets. Who doesn’t love their fury (or scaly) family members? In honor of love your pet day, Runway Games is doing a contest giveaway for a Red Sea Exodus t-shirt and other customized items. We will be selected the ugliest pet, and the cutest pet. To enter, send us a photo of your pet and all its glory. You may either contact us on Facebook, Twitter, or email info@runway-games.com. You have until the 19th! Get snapping! One of the cool things about making games is you get to make ’em about things you find interesting. Space, cowboys, robotic men – even rainbow unicorns with laser beam eyes. That’s why people love making games so much. Who doesn’t wanna make a game about something they find fascinating? We like space, for instance. 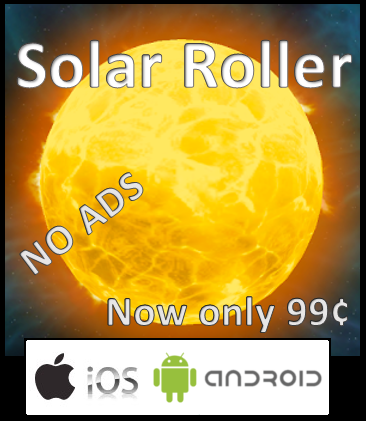 One of our games, Solar Roller, is all “spacey” and cool. Why? Because space is friggin’ neat! As if to prove how neat it is, last night, a giant space mountain (comet) flew by our heads. What’s more about this giant space mountain? That giant space mountain had its own giant space moon. So keep your eyes to the sky and maybe you’ll see some of space’s fanatical wonders for yourself in the future. If not? Turn on Solar Roller to experience them anyway. Or just play it when there isn’t anything particularly interesting whizzing by our planet. For more on the comet and its satellite, check out this article. The following piece is a guest blog entry. The views expressed in it are not necessarily those of Runway Games and are entirely those of the author. For more posts like this by the author, check out this page.